The flavour description is so long it needed the whole of the front of the bag to fit it on! The flavours are colour coded on a black bag and there is a retro styled cartoon image of the ingredients. The large writing dominates and the handwritten style makes it look a little confusing and hard to read. It is an effort at design, but only at an own brand level. It does not compare favourably with some of the Crisps specific company designs, despite Tesco's financial resources. A Munch Timing Test saw the largest Crisp in the bag last a full 18 seconds before it disappeared. The crunch was also sustained for most of that time, beginning with a cracking snap and gradually deteroirating down the crunch scale to mulch right at the last knockings of the little potato slice's life. 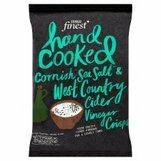 These Crisps looked fresh and hearty. Most were whole and they had a yellow glow about them that looked inviting. There was some skin on edges, but the fairly uniform colouring gave nothing away about the flavour. Most Salt & Vinegar Crisps provide a nose stinging Vinegar aroma, but these did not. There was very little smell at all. They were salty, but also very sweet and tangy. This was presumably what Cider Vinegar does to a Crisp. And yes, there was a taste of Cider Vinegar. We went into the experience expecting Salt & Vinegar, but instead we got what it said on the packaging. It was an interesting flavour and one that was fairly unique. It was however a little too sweet.